The Lava Butte Gardens route is an extended exploration of Rainbow Gardens that is situated around and below Lava Butte. This is a very interesting geological area found within the BLM Management's Sunrise Mountain Management Area. Lava Butte is not a volcano although it reminds us of one. It is composed of volcanic rock called dacite, which has been dated at about 13 million years; so these rocks are very much younger than the Paleozoic sedimentary rocks of Frenchman Mountain. On a fresh broken surface, the dacite of Lava Butte is quite attractive. It is light gray to lavender and contains visible crystals of mica, feldspar, and hornblende. The conspicuous dark coloration is rock varnish, a superficial coating of clay and manganese and iron oxides. 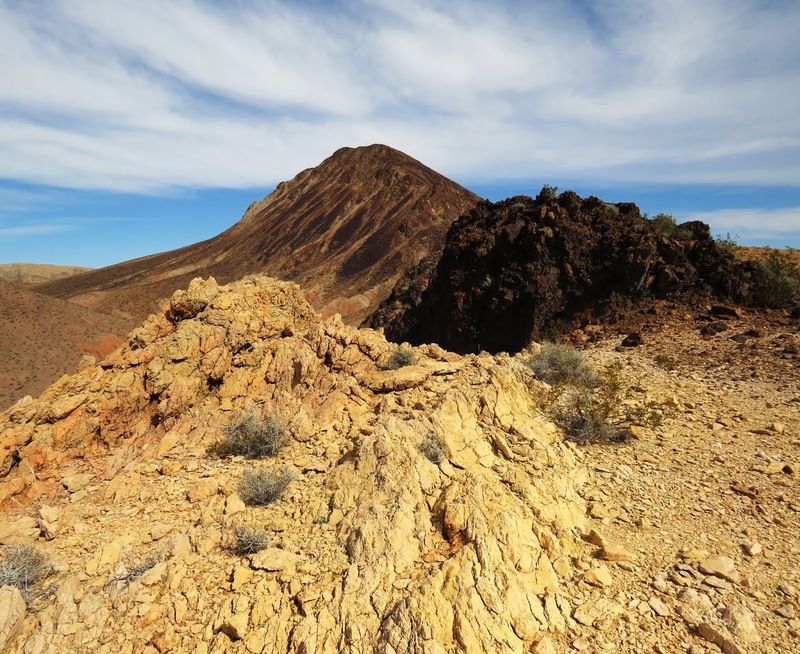 Recent mapping has led geologists to interpret it as a small volcanic plug (or laccolith) that came up through the Horse Spring Formation, forcing its way laterally along the formation for a short distance at one or more horizons. It now stands up as a prominent peak above its surroundings because it is composed of rocks that are more resistant to erosion than the soft sedimentary rocks that it forcefully penetrated. 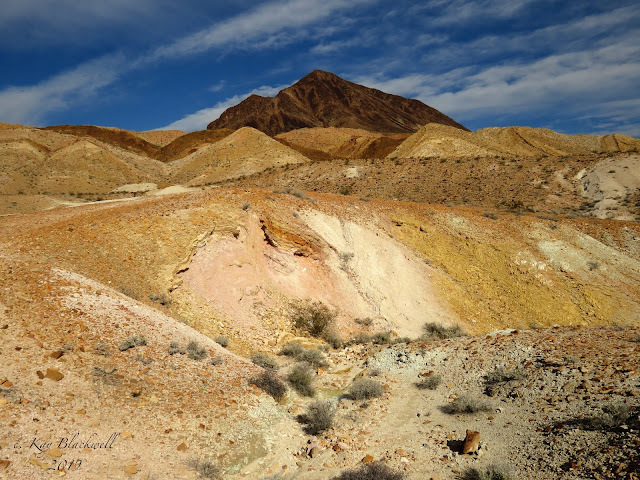 Surrounding Lava Butte are ridges and outcroppings of Aztec Sandstone that are capped by the Rainbow Gardens Member of the Horse Spring Formation (the oldest member of the Horse Spring, it was deposited at least 17 million years ago). This geologic formation takes its name from this area and, in turn, provides much of the color. Exposures of banded red, white, and tan-colored rocks in the closest hogback ridge beyond the wash to the west are typical of this formation. 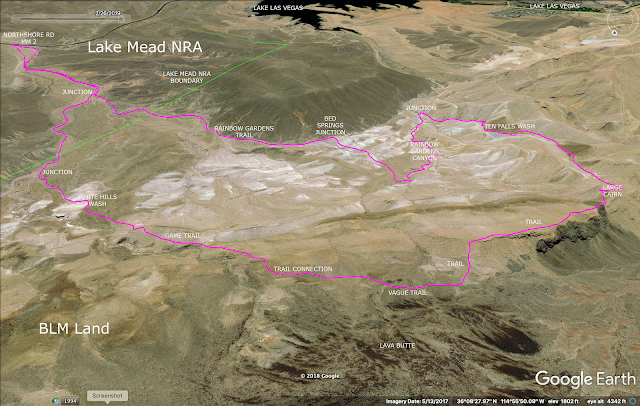 Geologic Tours in the Las Vegas Area (Expanded Edition with GPS Coordinates), Nevada Bureau of Mines and Geology Special Publication 16, University of Nevada, Reno, Mackay School of Earth Sciences, 2008, Bear Printing, Sparks, NV; pages 60-61. 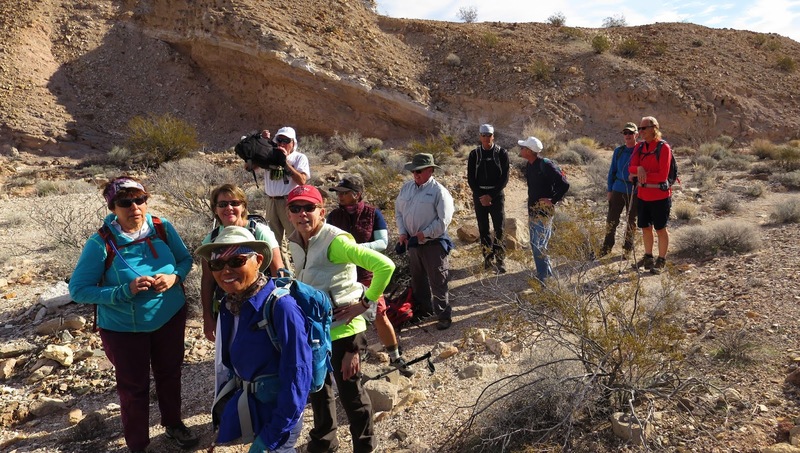 Thirteen club members arrived at the trailhead located at mile marker 2 on Northshore Road in the Lake Mead NRA. At first billed as a moderate hike, we learned today that it is more of a moderately strenuous hike due to the climbing involved. No worries. Our hikers today were in great condition and had no problems with the terrain. 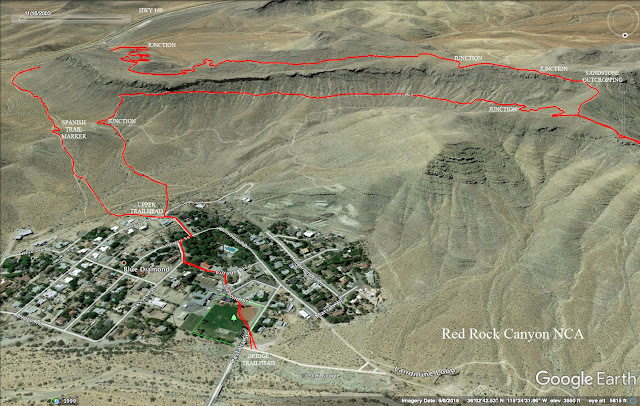 We started by hiking west from the trailhead in the wide wash. This main wash is often used for the approach to Lava Butte Peak. 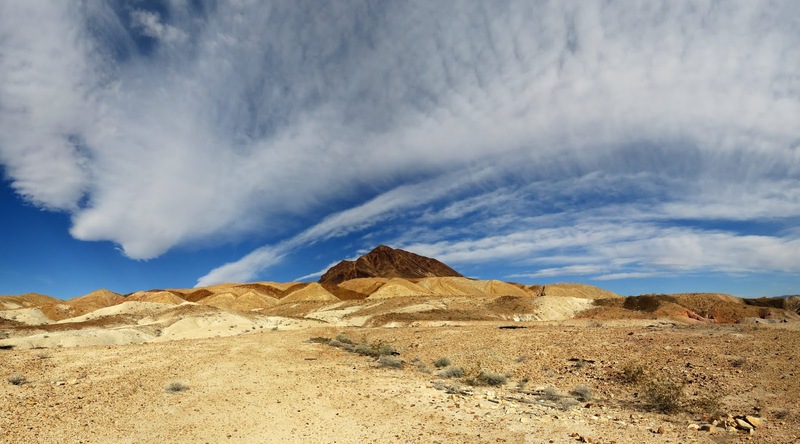 It is also used for the easier hike called Rainbow Gardens. 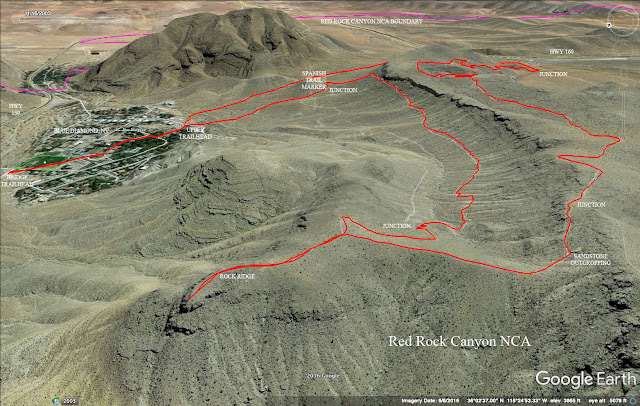 At about 1.5 miles up the main wash, the trail is interrupted by a small ridge. There is a lot of rusted mining and homestead debris at this junction, including some bed springs up to the left. We turned to the right and followed the trail to a small mesa at the base of Lava Butte with pastel colors all around in the hills and washes. On the other side of the mesa, we dropped into a shallow canyon wash that is referred to, by many locals, as Rainbow Gardens. We passed the yellow slab and the slot that dead ends at a dry fall. It seemed that the wash had been flooded out recently but the wooden ladder leftover from the small nearby mine still stood against the wall on down. At the junction to the right, (after the ladder), we turned to climb up a fun scrambling wash. I'll call it Ten Falls Wash! There are probably 8 or 9 dry falls in Ten Falls Wash of varying sizes and shape! They lie in the first half of the climb up to the cresting ridge. There is a game trail on the ascending ridge to the left but the wash is a lot more fun. 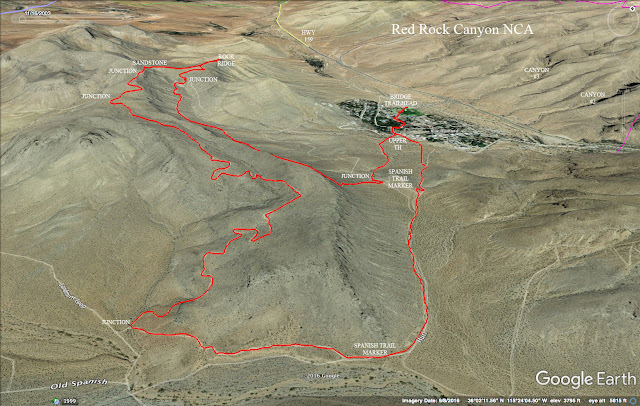 At one point, the trail meets the wash for a few yards then returns to the ridge. We continued up the wash and its following bowl to meet the trail near the top where someone has built a cairn with very large rocks. 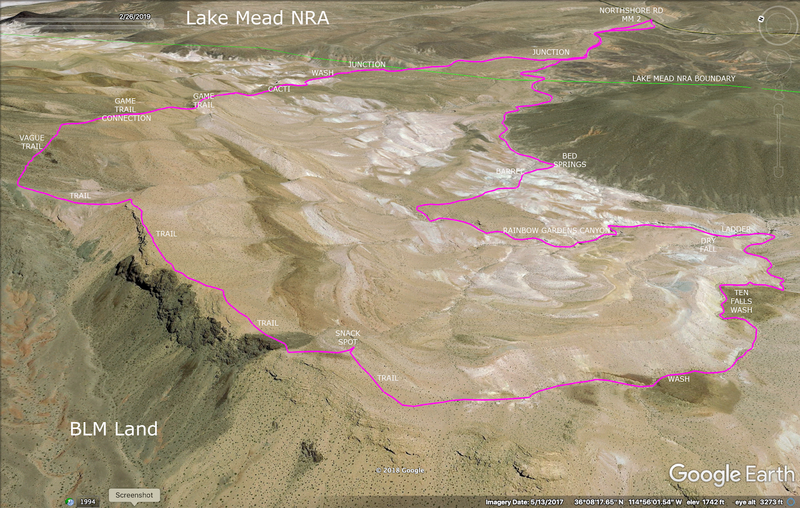 We stopped for our break here with views of Lava Butte, Rainbow Gardens, Lake Las Vegas and Lake Mead. Lava Butte towered above us impressively. The ridge precipitated in the form of cliffs on the other side and when we finished our break, we continued along the higher trail that ran approximately fifteen feet from the crest of the ridge. The trail descends off the ridge on the other side when you near the Lava Butte approach. We followed the trail down and up toward the dark rocky peak. It stopped at a point above the wash bowls to our right. So, we turned to the right and began following a very vague trail across the top of the arroyos that lead up to the peak. Through the rocks and on the next highish ridge, we stopped to assess. 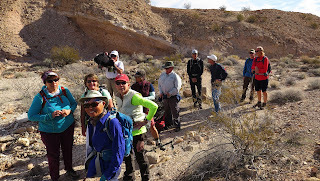 Some of the hikers had just done the Lava Butte climb last week and had descended through the wash that I was going to use today. When learning this, I was very happy to try something different. We had a couple of options. One option included a route that Laszlo had shown us called "the direct route!" But, looking for an easy descent that might feel nicer after climbing the butte, we headed over to the game trail that we could see next to the originally intended wash. The game trail started clearly but then disintegrated into a vague traverse on a steep screeish slope. It was not difficult to follow nor was it slippery. We just had to be careful on two places where the trail dropped down from high points. The second drop put us on a cactus-filled mesa. So many beaver tails and pineapple cacti. BTW, the beaver tails on this hike had many small buds on them! 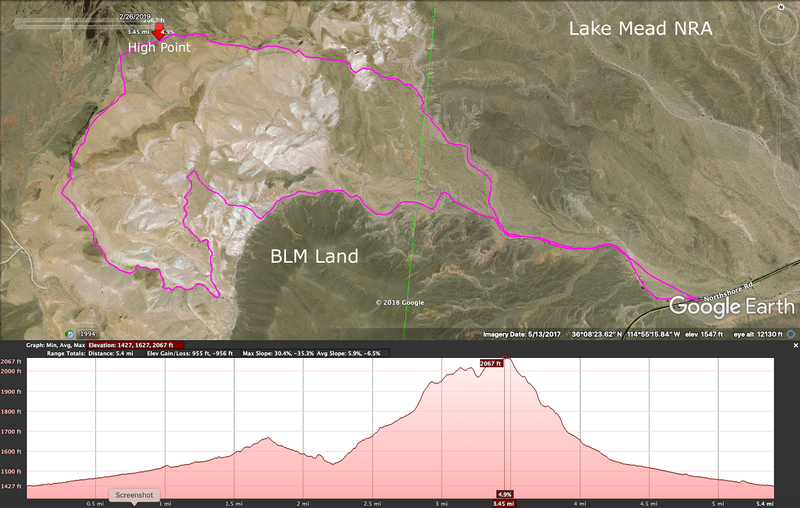 Still working on a nice new descent route, we headed for the opening between the two rising white hills in front of us. Down this rocky wash and we were junctioning with a secondary main wash right at a short concave rock wall. Turn right! All the washes in this immediate area flow into the main wash so even if you end up in a different wash going down, you will probably get back to your car! However, we were confident of our inner map as we picked up the pace in the hard flat sand. There was still around a quarter to half mile in the secondary main wash before we reached the main-main wash! Then, in the main wash, we had another half mile or so to get to the cars. It was a very enjoyable day with old friends. (... and new friends.) Not rushed. We learned a little more about this area. I hope it remains useful. 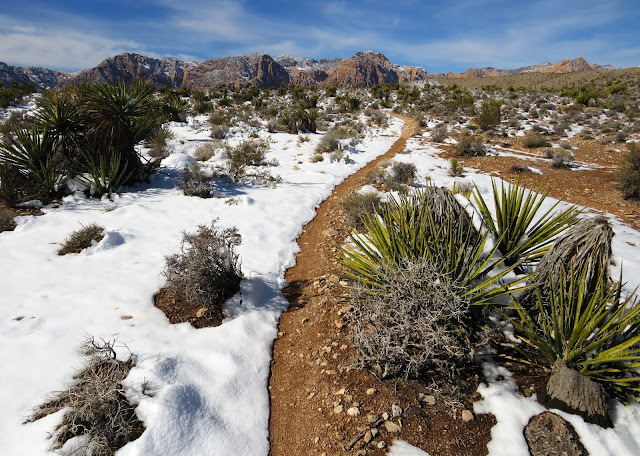 And, also BTW, the snow is almost gone and the temperatures are returning to what they should be in the desert at the end of February. Fun fact: Lava Butte was seen in the background of a chase scene in the James Bond movie "Diamonds are Forever." Two days ago, Las Vegas and the surrounding mountains ... yes, all of them ... received a lot of snow. This was a very unusual event and went down in the history books. Although a lot of the snow had melted by this morning, there was still enough to make things extremely pretty. It will be gone soon but, today, fourteen hikers were able to experience it first hand before that happens. We parked at the Blue Diamond Trailhead located just across the bridge on the right side of the road as you begin to enter the small community. We walked over to the restrooms at the ball field and saw the volunteer fire department checking their hoses. 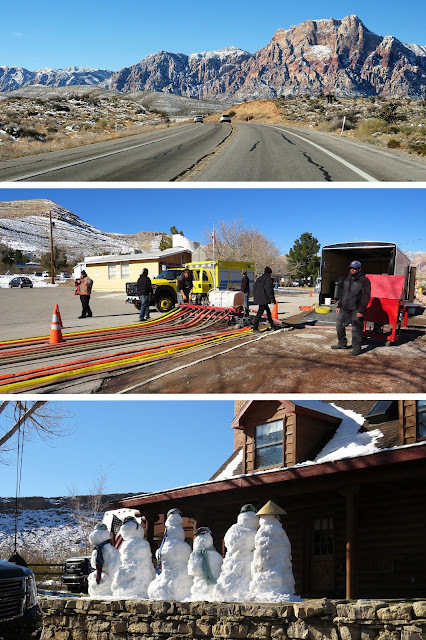 We circled around them and headed up to the upper trailhead area where the occupants of one house had built six snowmen on their landscape wall. The snowmen were wearing bike helmets! Finding the trail to be clear of snow and muddy at times, we crossed the wash and started up the hill. As always, we took the newbies up to see the Old Spanish Trail Marker when we came to it. It is on the hill to the right. Reaching the south side of the area not far from SR 160, a lot of the snow had melted away. 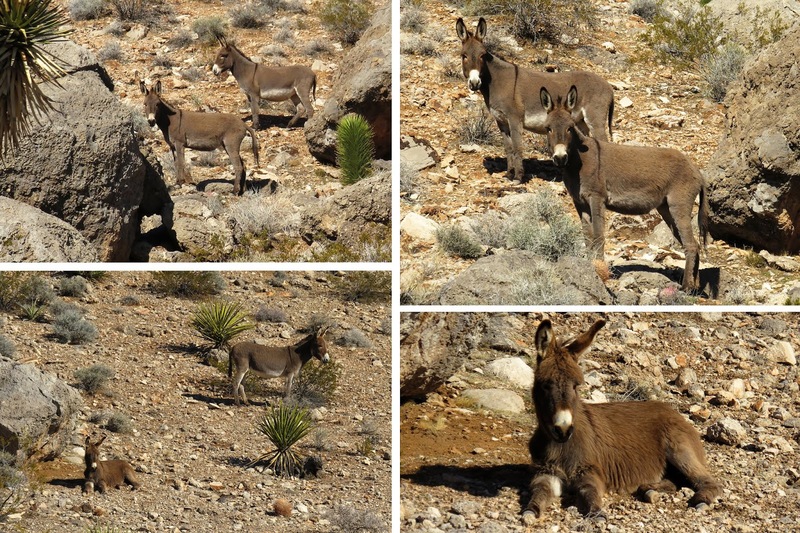 Two of our hikers pointed out burros to our right. One burro was a baby. So cute! Continuing up and over a little hill, we were rewarded a gorgeous view of Cottonwood Valley and Mt. Potosi beyond. On the other side of the little hill, we turned right onto the Hurl Trail. 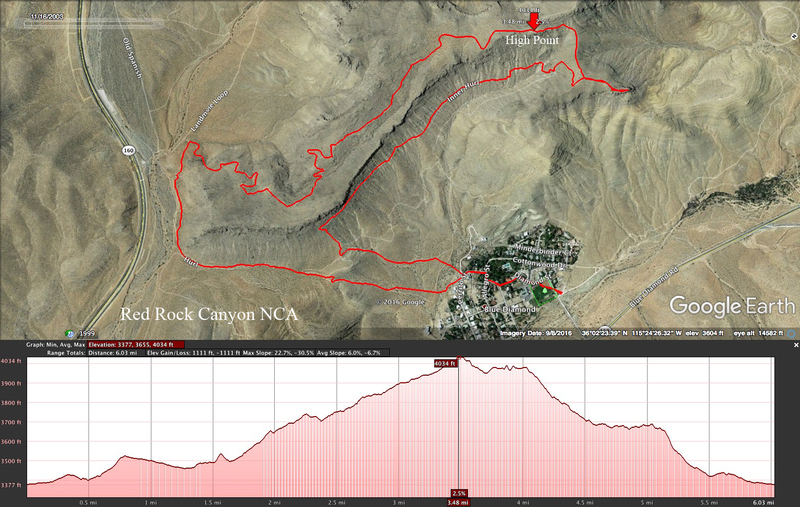 This is where the long climb seen on the elevation graphs below, begins. The climb is a little disconcerting to some hikers and many times, participants would like to stop for a long break about half way up. There isn't a great place to stop and sit because of all the sharp limestone strewn about. Regardless, today's group managed to make it all the way to the top of the climb before sitting down. We were 3.4 miles into the hike. Our perseverance was rewarded with an amazing view! So, why didn't we go down to the sandstone boulders? Well, the hillside where the boulders sit was covered with snow. It really wasn't a good place to climb up to the top of the sandstone to have a "soft" seat. And, the preferred alternative of the Rocky Ridge Overlook seems to be just too far for a moderate group of hikers. Anyway, we sat for our break, looked at the view then continued down past the sandstone boulders and the Rocky Ridge Overlook and turned to see the canyon descent. This small canyon has a trail on both the north side of the canyon and the south side. Of course, the south side (facing north) was still covered in snow and the north side (facing south) was bare. We had already planned to take the south side trail so we looked and saw that the dirt line continued here as far as we could see. 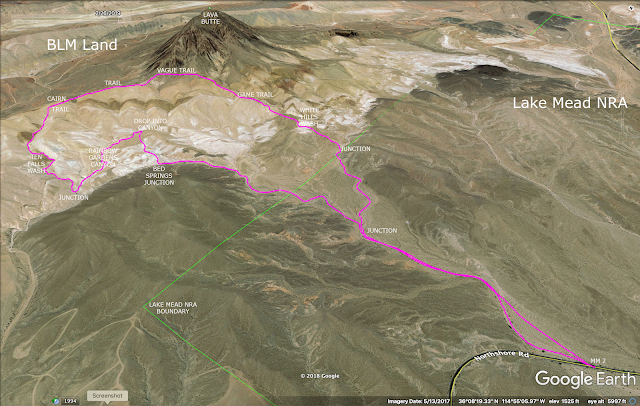 We also saw that the furthest points of the trail were still in shade. Hmm. So, we followed the dirt line through the amazingly beautiful landscape. Finally, we neared that shady part. 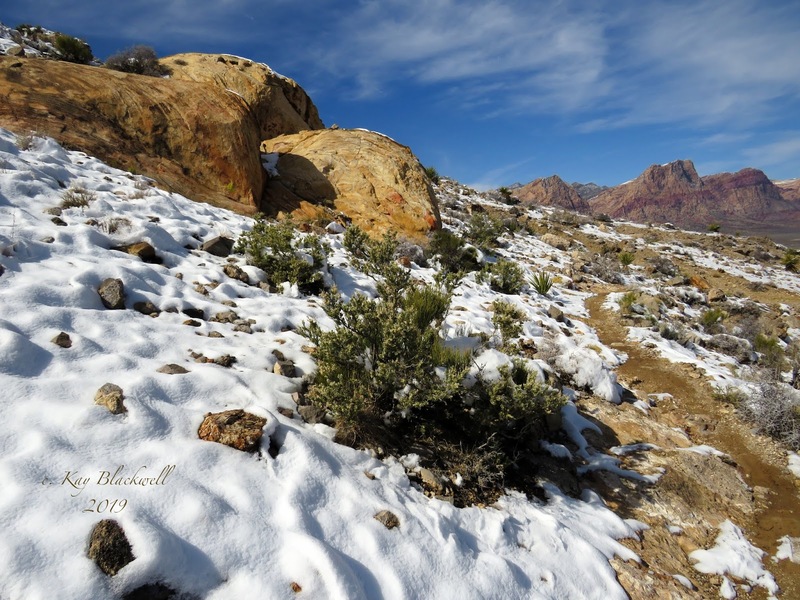 The snow still covered the trail here but a couple of bikers and hikers had already marked where the trail was located. It was just a matter of following the trail in the snow. Very carefully, we hiked up and down little hills in the snow for around 25 yards. There were no mishaps! And, before we had to descend back to the canyon / valley floor, the dirt line resumed. We junctioned with other trails in the area of the first Old Spanish Trail marker and turned left. A fork to the right sent us on our way straight down to the Blue Diamond area. On our way, we saw tracks in the snow of, perhaps, a baby burro and some kind of smallish cat. We also saw coyote prints and jack rabbit prints. The latter's trail headed into a burrow under a rock. When the trail that steeply crosses the wash appeared, we dipped down and saw that the wash had been dug out by a recent flood. Then, a running start got us up the other side's embankment. As we hiked through the streets of Blue Diamond to return to our cars, there were people in cars watching us (as there were on the way out). Not sure what the Blue Diamondnites think we are going to do to their town but they do keep an eye on things. Must say, it doesn't feel very welcoming. Fun day and everyone seemed to enjoy the morning.